The BlackBerry Q10 comes with a full array of social networking apps out of the box, as the company has finally realized that social networking is important for both regular folk and businesses these days. The Facebook app shows you your wall by default but you can easily check friend requests, messages and notifications. Posting a new status, image and checking in are equally easy. You can access more from the menu button in the top left. If you're wondering why the app doesn't use the standard BB OS 10 menus, it's because it just encapsulates Facebook's mobile site. Still, it works well enough. It's the same with the Twitter app. It shows you your timeline by default, but you can also use search, see what's trending and so on. Posting new tweets is easy and you can snap a new photo right from the app itself. LinkedIn is a native app that allows you to interact with the social network for people with professional occupations. You can post, look for connections, check your inbox and more. Foursquare is a native app too. It lets you check what your friends are doing, search for cool new places and see how you're doing (your stats, badges and so on). BlackBerry 10 comes with its own map application with map data sourced from TomTom and TeleCommunications Systems. The app only features regular maps - no satellite images or street view. It can show traffic information, but there's no public transport or pedestrian navigation support. The database of places and venues isn't nearly as rich as that of Google Maps and the maps load pretty slowly too. In fact, map coverage outside the US is spotty at best. Searching is virtually unusable - the first result for "Times Square" is in Massachusetts. That or the UK. Even when looking for streets in Canada, the Maps application most often came up short of delivering meaningful results. The Maps application does have voice-guided navigation though. It requires an Internet connection. You can tweak the route finding algorithm by telling it to look for the Fastest, Simplest or Shortest routes and to avoid highways, toll roads, carpool lanes or ferries. Night mode can be enabled, disabled or set to activate automatically. You can add favorite places (Home and Work get special treatment) to find your way faster. If a contact from your address book has location info, you can quickly navigate there too. But you can't pick a point on the map and get a route to there. Overall, our experience with BB OS 10's Map application is pretty frustrating - there's almost no map data, what little data there is, it is hard to find and the whole thing is dog slow. We'd wait for Google to release a Google Maps app for the BlackBerry World before considering using the Q10 for navigation. 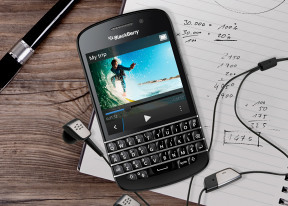 The BlackBerry World app is your gateway to over 100,000 apps for your BlackBerry Q10. While not as many apps as Android and iOS have (or even Windows Phone), many of the major names are available. World is not too different from the Google Play Store. It shows featured apps on top of the screen, then two featured categories. Below that are Trending apps & games, Top paid games and Top paid apps. You can browse just games or just apps, which also reveals the Top free items of that category. Speaking of categories, both apps and games are sorted into genre categories, if you're looking for a specific type of app/game. Apps and games usually come with at least a few screenshots and a description. You can also read user reviews, complete with a star rating. We already mentioned that BlackBerry World has a respectable number of apps for a new app store, but a good 40% of those apps are Android ports (BlackBerry handed $100 to devs who port their Android app to World). Those apps are run in an Android 2.3 player, which means they don't really mesh with the rest of the interface, not to mention that they use outdated Android controls. BlackBerry has plans to upgrade that to Android 4.1, but there's no set date for that happening. Running apps through an emulator is not an ideal solution, but it's the only way for a newly launched app store to get a respectable number of titles. If the BB10 lineup does well, we are sure many developers will release native versions of their apps sooner, rather than later. Just like Google's Play Store, the BlackBerry World offers more than just apps - you can buy music, movies and TV shows from here. You can just rent them too. With DLNA and microHDMI port, the BlackBerry Q10 can be used as a serious media player, though things like Netflix and Hulu are still missing. BlackBerry Q10 also offers a Games center, where you can track, share and compare your games progress with your friends.